Movie legend Robert De Niro has given a huge contribution to the Hollywood industry over the years, leaving a permanent mark in the history of cinema. 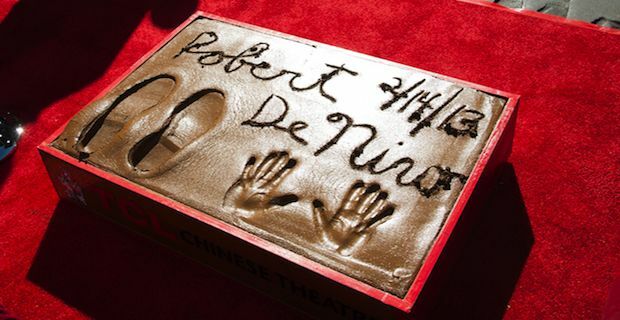 And to make this less metaphorical, he was recently invited to the notorious Handprint & Footprint Ceremony at the TCL Chinese Theater in Los Angeles, so he could leave his imprints next to the ones left by other movie icons such as Humphrey Bogart, Shirley Temple and John Wayne. "You know, Joe Pesci always said I'd end up with my feet in cement," said the 69-year-old actor "I don't think this is what he had in mind. ", referring to the mafioso rituals featured in gangster movies such as 'Goodfellas' and 'The Godfather'. He added "They say everyone in the film industry has three homes: The home where they live, the home where their first wife lives, and Hollywood. I love New York and I am proud to be a citizen of Hollywood. Thank you for this honor and thank you for making me feel at home here." Director David O. Russell and actor Billy Crystal - who have been working with De Niro in the Oscar-nominated 2012 romantic comedy/drama 'Silver Linings Playbook' - took the stage to celebrate the actor, with Crystal pulling another cement-themed joke. "I am so honored to be here to help put his feet and hands in cement, something he had done in films to a lot of other people" he told the crowd "there has never been anyone like him on screen, and there never will be again." On a slightly embarrassing note, when the time to write in the fresh cement came, the actor got mixed up with the date (incorrectly writing 2/14/13 instead of 2/4/13) which has now been fixed.